Wield the power of Thanos… and have fun in the process! Classic, retro-styled toy inspired by Avengers: Infinity War. Push the hidden button to see the thumb and fingers move! Crafted of solid wood, with vivid, highly detailed, 360-degree artwork. 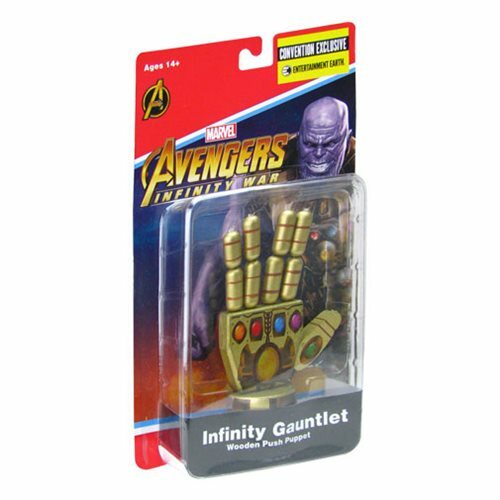 Thanks to the clever designers at Entertainment Earth, you can wield the power of Thanos with this amusing 4-inch tall floppy wooden puppet that collapses, moves, and stands up again when you push the hidden button on the bottom of the base. Yes, the thumb and fingers do move! 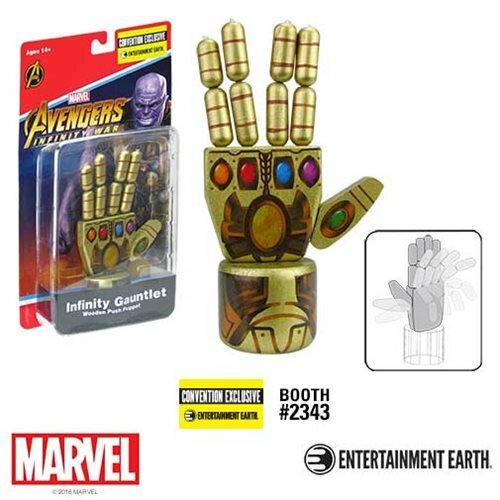 Created from solid wood, this collectible Avengers: Infinity War Infinity Gauntlet Wooden Push Puppet - Convention Exclusive features vivid, highly detailed, 360-degree artwork that includes the Infinity Stones. Fun as can be, it's a limited edition of just 1,500 pieces with an individually numbered holographic sticker. Ages 14 and up.